Bring a medium saucepan of water to a simmer and add the white wine vinegar. Add the quail eggs and simmer over moderate heat until hard-cooked, about 7 minutes. Drain the eggs and crack the shells against the side of the pan. Fill the pan with cold water and let stand until the eggs are cool. Meanwhile, in a medium saucepan, combine the 6 cups of water with the lemon zest, cracked pepper, bay leaves, fennel seeds, star anise and 1 teaspoon of salt. Simmer the court bouillon (seasoned water) for 5 minutes. Add the shrimp and simmer just until cooked, about 2 minutes. Drain the shrimp in a colander; let cool. Pick out and discard any bits of seasoning. In a large pot of boiling salted water, cook the haricots verts until crisp-tender, about 4 minutes. Drain well and spread the beans out on a baking sheet to cool. In a small bowl, whisk the sherry vinegar with the mustard. Whisk in the olive oil and season with salt and pepper. Peel the quail eggs and halve them lengthwise. In a large bowl, toss the arugula with 1 tablespoon of the dressing and spread on a platter. In the same bowl, gently toss the haricots verts with the shallots, quail eggs and all but 1 tablespoon of the remaining dressing. Mound the haricot vert salad on the arugula. Add the shrimp to the bowl and toss with the remaining 1 tablespoon of dressing. Top the haricots verts with the shrimp and serve. The recipe can be prepared through Step 4 up to 1 day in advance. 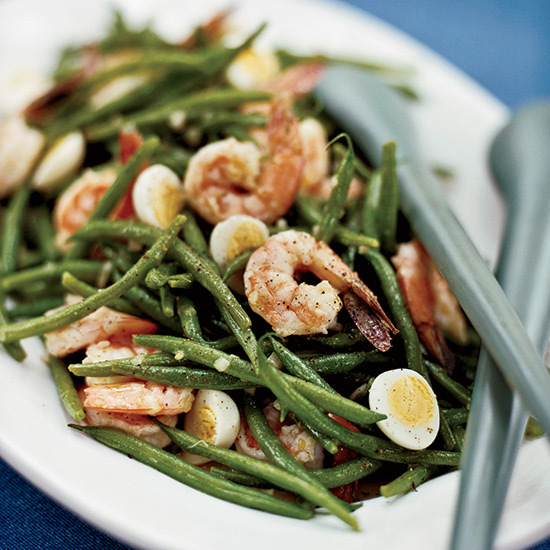 Refrigerate the shrimp, haricots verts, eggs and dressing separately. Instead of quail eggs, you can use 6 large chicken eggs; boil for 10 minutes and halve lengthwise.